I love my friend Kim’s community contest, Project Quilting. It’s one of my most favorite challenges. We’re now on season six and it’s my second year participating. We’re given a week to complete a brand new quilted item on a given theme. This time it’s trees. I spent most of my time on this project brainstorming. I had lots of ideas and points of inspiration. A triangle quilt mimics pine trees. Ripples look like rings inside a tree trunk. Wood-burning, staining, furniture making, tree houses, weeping willows, deforestation, the closing of a cut your own Christmas tree farm, my fireplace, climbing trees, tree swings, changing seasons and the colors of leaves, and a family tree were just some of the options. I decided to go with the colors of leaves in the spring: the light and medium greens. I was given a bunch of batiks from a friend who got some scraps from Hoffman so I got that bin out and started playing. I sewed these strips together until I was out of greens and then asked the piece what it wanted to be when it grew up. Well, I expected something fancy but this one wanted to be a table-runner. The image that came to mind was of this on a white tablecloth with tulips and a bunny figurine for Easter. Okay. I can do that! Here’s the top which has been squared up and is ready for sandwiching and quilting. It’s kind-of cute, right? It could be seen as grassy or leafy and definitively looks like springtime. I look a little concerned in the picture but that’s because this was the 10th selfie I’d tried to take… and none of ’em were coming out the way I wanted them to. After this I called it good enough. Quilters have until Sunday to finish and submit their projects. After that the voting begins! The winner gets a prize. There are also prizes drawn at random for everyone who participates. I won a pattern last season! There’s a lot of activity over at the Challenge Quilts group on Facebook. One of my favorite things about it is we get to see artist’s work in progress. Another thing that’s awesome is that I’m seeing children get involved in making quilts this time around. Here’s Capri’s quilt top. This entry was posted in Challenges, Critiques, Favorites Friday, Inspiration and tagged brainstorming ideas, challenges, Easter decoration, Easter table runner, green table runner, Hoffman batiks, inspired by trees, kid quilting, kids quilting, pq6, project quilting, quilt challenges, spring greens, string quilt, trees on January 8, 2015 by quiltartbymegan. 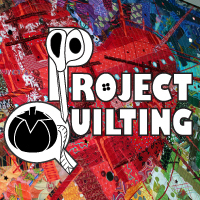 Project Quilting rocks, and I’m so glad you’re playing!